3 bedrooms, fire place, ambience, rural block with views walk to village 2mins. Stunning character filled 50's cottage located the heart of Berrima. Only minutes walk to the restaurants and cafe precinct. My cottage has been styled using luxury pieces, artwork and beautiful linen personally chosen by myself, our brand regularly appears in magazines and captures the attention of creatives from all around the world. 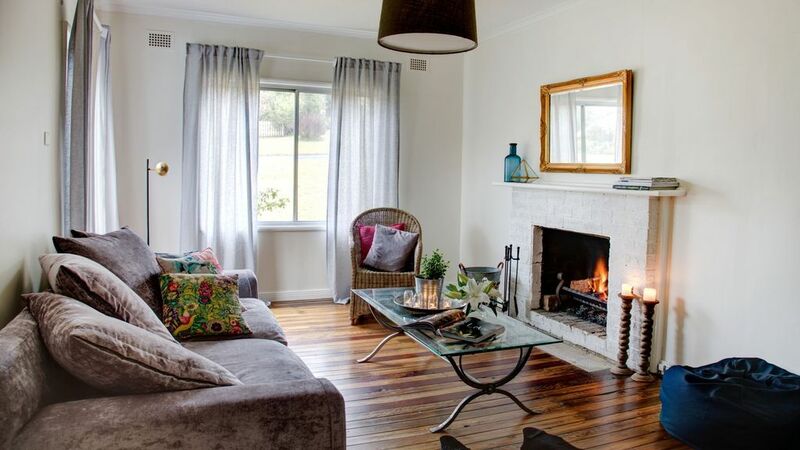 This beautiful cottage offers you an open fire to enjoy during the cooler months. In the summer, we enjoy swimming and fishing in the Wincaribee River only a few mins walk from town. Full kitchen facilities, small but functional bathroom, 3 queen bedrooms, flatscreen tv and video and this is just the beginning. Enjoy the finer qualities like the federation style doors and vintage retro handles, french character doors, cow hides, bean bags and le forge furniture. Although just a new listing in the Berrima region, we have set this property up with your perfect weekend in mind... comfort, class, cosiness... romance, family escape egardless of your reasons, we know you will love our beautiful cottage. Exclusive to our cottage only is a selection of gourmet dinners to suit any occasion. If you are interested in having dinners prepared & awaiting your arrival, speak to Sarah about how Woodgreen Pantry can enhance your stay in our cottage. Exclusively for your, we can provide you with a selection of gourmet dinners to suit any occasion. ***If you are traveling for a wedding in the Southern Highlands, we believe our cottage is a perfect answer and is priced reasonably and perfect to split costs with friends. We are only 2 mins drive from the beautiful Bendooley Estate. Pricing is for the whole cottage. We do supply linen, towels, tea and coffee. James Rose is the culmination of my passion for stylish, understated interiors and my husband’s extraordinary ability to restore a building back to its former glory. Together we create beautiful spaces that you get to enjoy. When you stay with us you will see that nothing is uniform. Every living area has been lovingly designed to ensure your comfort. Unique pieces can be found throughout the rooms at each of our properties, giving them a level of warmth and comfort that you do not get in a hotel room. Step outside and the building that you are staying in is as unique as the rooms inside it. Stop for a minute and imagine the stories that these charming and exceptional buildings could tell you. That is where we are different. We want where you stay to be as special as what you do, when you get the opportunity to get away. We welcome you to James Rose Unique Accommodation. I have always loved the Southern Highlands, my husband and I love to prepare homes that we can enjoy also on weekends. We find this property so easy to make ambient with candles, we have left it fairly raw, it is not modern, we have improved on the elements that make this property special. Styled property, beautiful comfy velvet down sofa to sit in front of an open fire, the garden has rural outlook over the valley and we are 2 mins walk from town. There are so many interesting things about Berrima. It is the home of many well known musicians and not uncommon to find a kangaroo or wombat foraging around in the garden. our backyard looks towards the wincaribee river, no river views but rural paddock and outlook of bush and hills. We had a comfortable and restful stay at this house. It is convenient to Bendooley Estate and is close to the middle of Berrima with its pretty shopping strip. The fireplace and soft furnishings in the bedrooms make it cozy! Enjoyed our stay as it was cozy, relaxing and the extra personal touches made by the owner through excellent communication made our weekend away so special. Highly recommend to everyone and definitely book again. Pure luxury. Enjoyed our girls weekend away in the lovely Characters Cottage Berrima. Great location, close to town and a short drive to Bowral and Mittagong. Lovely open fire to the cold nights and also a gas heater for instant heat. We enjoyed our stay at Character Cottage but the bathroom definitely a miss. Very small, toilet in bathroom. We had five people staying. Would be fine for a couple. Thank you for your review... I'm glad you enjoyed yourself it is such a beautiful place for a wedding, we certainly try and describe the property accurately right down to the bathroom which is yet to be renovated, and we were in such regular contact too.. safe travels. A fabulous place to stay. Peaceful, the people helpful but kept to themselves, we all loved it. I would have loved Wi-Fi because my internet signal was scratchy. We are 2 mins drive to beautiful Bendooley Winery, 10 mins drive to Bowral, Mittagong, Mossvale. Too many amazing restuarants and wineries within minutes to mention. We have owned property 6 years and still have more to discover.